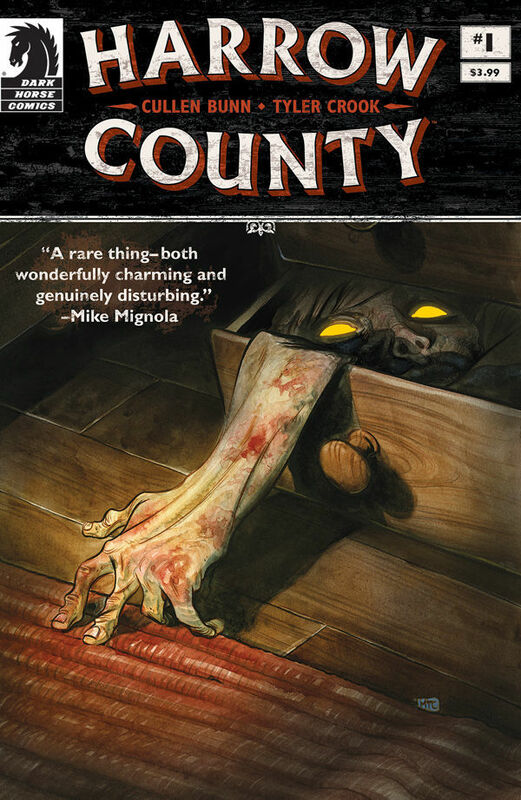 Dark Horse Comics “Harrow County” will have you crawling out of your skin. With no spoilers given, I can say that Dark Horse Comics’ newest horror fantasy called Harrow County is like tucking into a good Ray Bradbury tale. It’s a coming of age story about rural farm girl Emmy and a community with some secrets. The opening pages, worthy of Mario Bava’s Black Sunday, immediately draw us in as “healer” Hester Beck loses her life at the hands of the titular town’s folks. Her dying words threaten that there will to be hell to pay and her murderers can only wait for the other shoe to drop. Harrow County is an excellent pairing of prose and art that truly compliment each other. Cullen Bunn’s (Deadpool) script is thoroughly attentive to sense and natural surroundings (“Her earliest memories were those of the taste of freshly turned earth and the bleating of goats.”) as well as the progress of the narrative. The work is peppered with colloquialisms like “haints” (ghosts) and “snake doctors” (dragon flies) that ground us in the locale. There is also a one page strip “Tales of Harrow County,” drawn by Owen Gieni, that gives us an additional glimpse of the supernatural events plaguing the residents. Tyler Crook’s (B.R.P.D.) renderings of Emmy and her circumscribed world are embellished with a palette of watercolor washes of muted autumnal green and burnt orange. The children’s book look of the art balances the descriptive gravity of the text and makes the gorier visuals all the more impactful. Issue #1 is a fine set-up for this new ongoing series with just enough of a creepy cliff-hanger to make you wait breathlessly for answers. Look for it at your favorite comic shoppe on May 13th.